Looking for more ideas on how to spend your days in Paris? You must download our Free 4-Day Paris Itinerary! Wondering how and where to spend your shopping day in Paris wisely? You don’t need to be hustle and bustle around the city anymore looking for the latest fashion items. 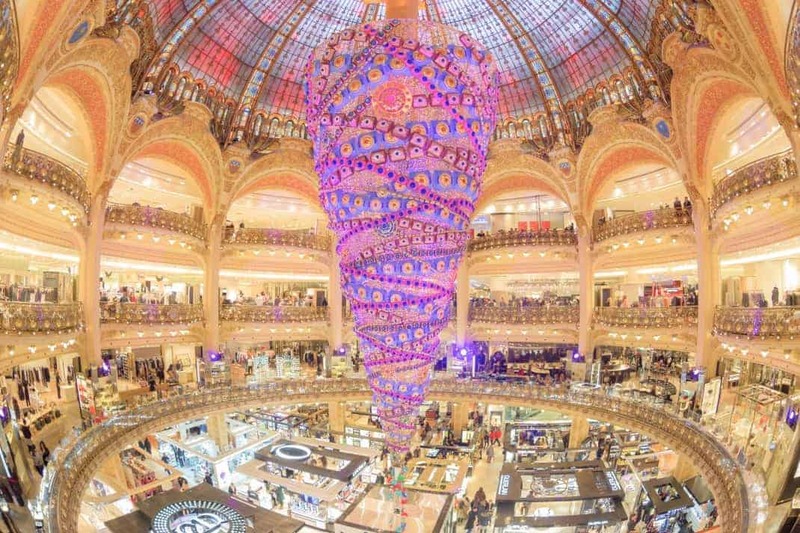 Just one visit to Galeries Lafayette Haussmann will surely tick all the items on your to-buy & wish list! INSIDR Paris has prepared a day trip programme at the oldest, largest, and the most beautiful department store in our city, just for you. Now, what are you waiting for? Get lost in this 70 000m2 shopping paradise to stock up your new wardrobe! 9:30 am : Breakfast at Tiff…Angelina! Breakfast at Tiffany’s is OUT. When in Paris, Angelina is a must-visit for foodies and dessert-lovers. Start your day with the best hot chocolate and macaron in Paris! Or try their exquisite French pastries or club sandwiches for your shopping energy boost. The very classy décor and tableware they have will make you feel like a French noble. Oh! And you don’t want to miss out their signature Mont Blanc dessert, so very heavenly! Shopping is no longer ladies’ privelege: it’s time to pamper your HOMME of the life with the French touch in style! From casual wear to high-end fashion products, the Men’s Department offers you the choices of 250 French and international brands from 3 levels of 8 000m2 shopping space. Alternatively, pick a Frenchie perfume for him at the fragrance section, leather goods, or simply let him explore his favorite items. He will definitely love you to the moon and back! What about some quality cuisine to spice up your shopping time? More than 20 restaurants serving international and high-quality dishes are waiting for you! From a quick lunch at Le Pain Quotidien or a full meal at The Steak Point, to a budget cheap meal or a nice place to eat. Or, if you miss home, from Chinese Dim Sum to Japanese sushi, it’s your call! End your lunch with a delicate dessert from Alain Ducasse Chocolate or L’Eclaire de Génie, celestial! Ever wonder how to look as stylish as the models for Paris Fashion Show? Join the free fashion show every Friday at 3:00pm to gain some inspirations for your to-shop items! You may also want to check the hot trends at Fashion Laboratories to review trendsetting items by famous designers or luxury brands. Ready for your shopping time? Off you go! Shopping all-day could be tiring, we know that. Why not treat yourself with a nice glass of wine against the backdrop of a Parisian panorama? Enjoy the stunning view of Paris at the coolest rooftop terrace on the 7th floor of the Coupole. The Ice Cube Bar serves you drinks and munchies with live music in a Arctic-styled transparent igloo. No winter breeze, only tipsiness, Tour Eiffel and lots of bonheur!